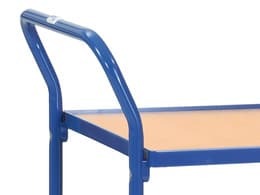 What Is The Purpose Of The 2 Shelf Table Top Cart? 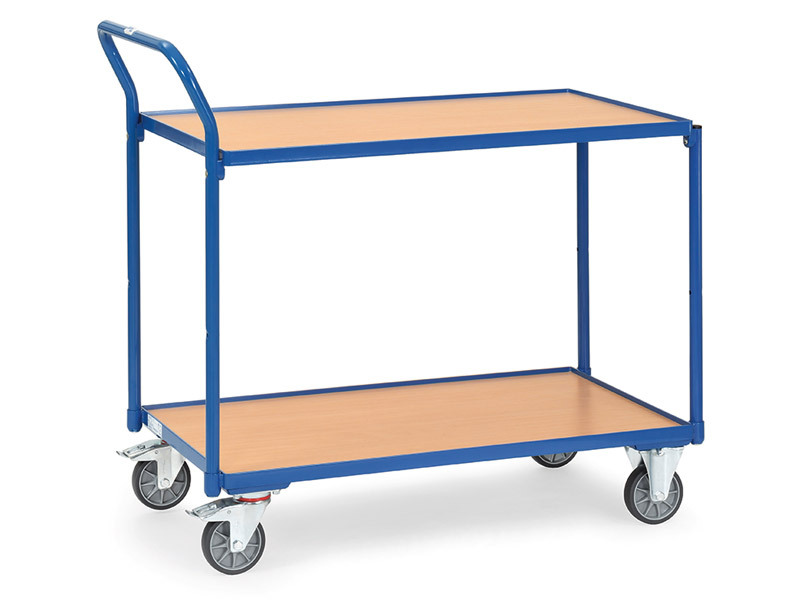 This 4-wheeled trolley is a wonderful tool to keep around the workspace and the warehouse when you need to transport items to and from work stations. The two shelves have more than enough space for all your tools and parts and can be easily stored and transported wherever required. 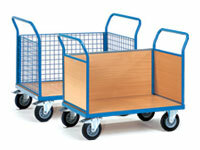 This table top cart has been designed to withstand a load of 300kgs. It’s an incredibly sturdy construction because of the welded tubular steel frame and the sturdy timber decks on each shelf. Complete with push bar, the thermal plastic elastomer wheels will outlast anything you can put it through. 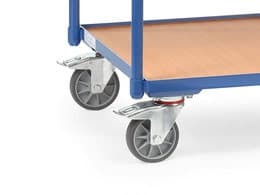 The two swivel wheels allow for easy steering and manoeuvrability while the two fixed wheels ensure that the platform trolley doesn’t go out on its own when you don’t want it to. Find out how to get yours delivered as soon as possible. Where Can The 2 Shelf Table Top Cart Be Used? Who Might Use The 2 Shelf table Top Cart? This hand trolley can be used by any mechanic with car parts to store and label. It can used by tradesmen with an assortment of tools, big and small. It can be used by warehouses that need to easily shift large and bulky items across vast spaces. Fulfilment centres, home sheds, and even big box stores can make use of this convenient table top cart. 300kg capacity due to its sturdy welded steel construction. Supplied in standard blue. Available in 1000’s of colour in the standard RAL colour range. 2 fixed and 2 swivel wheels made of Thermal Plastic Elastomer for non-marking surfaces.